Designed to withstand the most powerful shots, the Pro Training Futsal Goal is easy up, easy down and features an authentic white net, cross bar and posts. Official 3M x 2M Futsal size. Unlike other training goals, the Pro Training Futsal Goal offers a more authentic visual. Built to stand up to the most powerful shots, the goal combines an authentic white net, crossbar and posts with an easy set up and lightweight design, giving you the look and feel of an authentic goal without the weight and hassle. 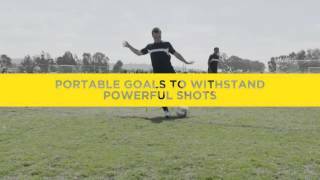 Engineered to stand up to the most powerful shots, Pro Training Futsal Goal is the perfect solution for individual training sessions, team practices or pickup games. Pro Training Futsal Goal, like the entire Pro Training System, is designed to work on turf, grass and courts. And unlike other portable goals, this one gives you true, game-like feel and stands up to seasons of use. Training your eye on the goal is key to scoring. Like regulation goals, the Pro Training Futsal Goal features a white crossbar that makes the target more visible and, again, offers truer, more game-like action.